Thurman Street - Victorian - Kitchen - Portland - by Garrison Hullinger Interior Design Inc.
Cabinets - Are these cabinets mid continent broadmoor door? Simply and Serenely GORGIOUS!!! Will you share the cabinet mfg please? Thanks so much, these were custom cabinets made locally. This is also a compliment, not a question. - You have created what I would describe as the kitchen of my dreams. This is the prettiest kitchen I've ever seen. If for some reason, money were no object, and I could have the most ostentatious kitchen in the world, I would still prefer this kitchen. It is obvious you used top quality stuff, but there is nothing pretentious or hoity-toity about it. Every aspect of it is just beautiful, and functional, and most importantly HAPPY! Sorry for being such a sexist. I should never have assumed that just because your taste was the same as mine, we must be long lost best girlfriends. Thank you for checking. So the door to the patio is to the left of this nook with the main part of the kitchen to the right, correct? The photo of the kitchen is the only one we have found that mirrors the approximate dimensions and door placement to the one in the house we are purchasing. It seems that the nook was added just to provide some seating in the kitchen with (assuming) the main seating for dining is in the dining room. Can you tell me what size the rug is that is under the island? Brass looks classic. Brushed stainless or brushed chrome are played. Brassy seems pretty classy in this setting. what kind of sink? Rohl? Sink is ROHL Shaws and the faucet is Inca Brass from their Country Kitchen collection! Dimensions - This kitchen is an absolute dream. What are the measurements of the room? Including the ceiling height. Hello! I have a similar shaped kitchen without an island. Where the range/oven is in this picture is where we have a small peninsula with 4 stools. I would love an island however, and was worried that I didn't have QUITE enough space. I see that you gave the dimensions, but could you tell me how much space one would need to walk around the island and still be able to function comfortably? we have approximately 7.5 feet from our range (which is where the sink is in your picture) to the peninsula across the kitchen. do you think, from a professional point of view, that we could squeeze in a small island? We have 36" clearance on each side of the island to the sink and range. We also used a french door oven so as to not have a large door coming down in the path. We really consider 48" a great distance for work zones but find that 36" is a minimum and feels a little tight with you and a helper in the kitchen. Beautiful kitchen! - What are the dimensions and ceiling height? Thanks! What make is the sink and how much $? where did island come from? can it be purchased? thanks! be marble. Very simple & will be painted the green (or white). Beautiful. I love the island. How wide is the space? thanks. I am interested in the island. What is the make and what are the dimensions? We had this piece of furniture custom made for the space, I do not have access to the specific size. what is the manufacture of the stove? I love this kitchen so much! Congrats for creating such an inviting space! I want one of these LaCornue ranges, but will be installing it in a small town in Wyoming. If it needed service, I wonder if it would be impossible to get anyone out to fix it? Any suggestions? Thanks so much cmjensen! I'm sure it would take some lead time when working with a top-tier brand like La Cornue, I would ask this question of your supplier where you will purchase the range. 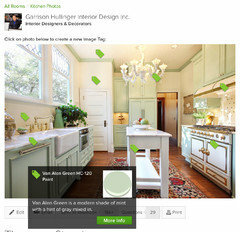 Check out the tags on our project photos, we've highlighted many items within the project including paint colors. what are the counters? Color? Stone? Were these cabinets painted after they had been installed? I just love this kitchen - it's like a happy place! How long can painted cabinets last before repainting is needed? This is just a compliment, not a question. This kitchen is the most gorgeous I have ever laid eyes upon. I was going to paint my kitchen cabinets green, but was afraid I'd tire of the green.. Now when they age I know what color they will be, the same as these . You are one very talented designer. This entire home is gorgeous. Just my style. Absolutely beautiful! I would love your opinion. I am using carerra marble, white cabinets with glass doors. I have Aga white range. I really wanted to use aged brass fixtures including pot-filler. However, I also have SubZero glass door and chrome refrigerator. -- will mixing the metals be weird. I love the brass you used but its also on the Lacanche range so it balances out. Your work is absolutely beautiful!! Thanks so much Susan...your kitchen sounds lovely! With this kitchen we purposely mixed the metals and that is what allows us to have the microwave drawer in stainless and other stainless accents, even though we mixed the brass accents throughout the kitchen. I think you can pull this off with the mix. Where can I find cabinets like these? These cabinets were made by our local craftsman. i am lookin for a rug just like this... any ideas where i can find one? thanks! Can you tell me what size rug is under this kitchen island? 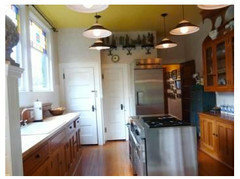 1901 kitchen remodel, on Thruman Street, would love to see the house style, thinking maybe Victorian? It almost looks like you put molding on flat cupboards or am I not seeing it right? I am new to Houzz, and this kitchen is stunning! What caught my eye is the gold hardware especially the faucet. In 1998 I completely renovated my kitchen into a classic, traditional one, for my 1920s home. I also used all gold accents, including the faucet. Everything is still like new, even 16 years later. Now, however, the gold seems dated and I want to replace it with brushed stainless, because I think it looks dated with the gold. All my appliances are white and the cabinets are maple, all custom. My husband thinks I am crazy to change all faucet and cabinet hardware, etc. Can someone advise me-- is gold a very dated look? Would it look more up-to-date with silver-color hardware? Many thanks. Microwave drawer - Is that a microwave drawer by the sink? What brand? Hello kittyclarkmanson! If you asked about the island top, it is a custom fabrication Bianco Carrara marble top. We can do the similar island top for your kitchen if you are interested. We have a wide selection of marble slabs available, such as Bianco Carrera (White Carrara), Bianco Dolomiti (White Dolomite), Bardiglio Gray, Nero Marquina Black, White Onyx and Crema Marfil. la cornue - What is the color and trim finish on this la cornue? This a CornuFe 110 in White & Brass. This model only comes in 10 "pre-selected" combinations so it should be easy to find it online or at your local retailer. We specified the CornuFé 110, 44" dual-fuel range in ivory white with brass accents & brushed stainless steel trim. Kitchen cabinets - Gorgeous kitchen. 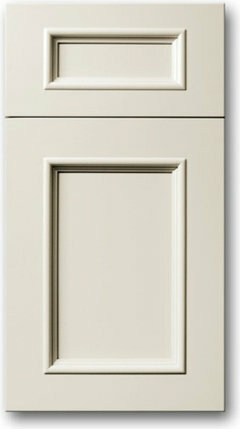 Hoping you could share the cabinet maker and name of the cabinet style doors. These were custom made at a local cabinet shop. Beautiful colors! What is the color of the cove molding? Check out the previous questions, I think we just answered that a couple weeks ago, thanks. What paint color is on the cabinets? Check out the small green tags on the photos; we've tried to tag all the items you might want to know about. Like the rug. Where is it from? What is the brand of oven? Is it a european brand that costs $20k? What is the color of the cabinets? Brand? I'd love to know the width of this room. It appears to be similar to the space we are currently remodeling. I am using wide plank pine floors and a narrow island (out of necessity). Assuming the cabinets are custom, are they poplar or maple? Terrazzo floors - Can you install poured terrazzo flooring over existing terrazzo? I'm not sure, you might check with an installer...these floors are douglas fir. What color is on your cabinets? Is the light fixture new? Where could I find one? What is the lower cabinet color? What paint brand? Please don't tell me it's a custom mix! Beautiful space. Try Colonial Revival Sea Green, SW2825 from Sherwin Williams' line. Benjamin Moore Paint Color HC-120 Van Alen Green is what we used for the paint on the cabinets. SW2825 has more blue to it. Where can I purchase one of those windows with the lead glass? I would suggest working with a local stain glass shop that focuses on windows. Glad you took a look at our project. Where can I find similar windows? I assume that these are originals. - I would like to find "leaded glass" look replacement windows. We worked with a local stained glass shop to create these new windows...we borrowed the design from windows in other parts of the home. Prior to the remodel a faux (plastic) stain glass covering was over the upper windows. Cabinets - Could you kindly give me the color of the cabinets? Thank you! Lynda, we try to tag all the key items in our photos, please check out the tags for your answer, thanks. counter tops - What color quartz is the countered. Trying to decide between quartz and quartzite....Is the beauty of quartzite worth the cost? The kitchen cabinet countertops are Concetto by Caesarstone - semi precious high end stone surface. The Concetto countertops would probably be more expensive than the quartzite stone. What is space bt the kitchen sink and the stove. - Gorgeous kitchen!!! This is the exact layout my designer suggested for my kitchen. My only fear is that there is too much space between the kitchen sink and the range. In my case there would be 7ft between sink and stove (directly across from each other). I cannot fit a secondary sink on the wall with oven. Do you find it functions well? Eg. carrying a pot of boiling water from stove to sink??? as well do you find the Island disrupts the flow? Asking because this is what my kitchen would look like. Many thanks! This is a tight kitchen and adding the island was a request of the clients. Sounds like your kitchen is going to be much tighter if you were to add an island between the sink and the range. Lovely! - The kitchen is so lovely, very warm and inviting. Would love to cook there. The entire transformation of this home is stunning!!! Kitchen size - What are the dimensions of the kitchen? Fridge - What brand is your fridge and how did they get it took look so much like part of the cabinets? Who made your cabinets? The cabinets were made by a local custom cabinet shop, many brands of appliances are available with doors to accept cabinet panels...then we used a complimentary door handle. Wood floors - Can you tell me the type and stain of the floor? These were 100 yr old floors that had a light stain applied to them during the remodel. Kitchen - I have orangish wood cupboards. Would like a creamish wall colour.lnow of any that go with the cupboards? Completing the look for your home would involve understanding all the components of the space. Love it. - The color in this kitchen is very soothing. Please provide me with a source for the hardware used on the cabinets. Remodelling - I love this kitchen, cozy and inviting. I just purchased a Victorian house and want to remodel the kitchen. I was wondering if I could send pictures of my kitchen to see if possible to duplicate. Part of my kitchen, sitting area has knotty pine wall panelling and the cooking area is square. This kitchen is laid out to take advantage of the space confined within these walls. I'm not sure what you're needing help with; cabinet layout, range size, placement of frig? cupboards. - It almost looks like you put molding on flat cupboards, or am I not seeing it right? 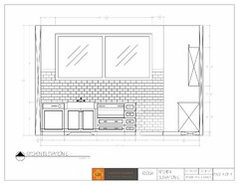 It might be the camera playing a trick...I'm attaching our plans and the door style we picked for this kitchen remodel. What color are the walls in this kitchen? - Love this kitchen also....it is gorgeous! Rug - Can you tell me where the rug was purchased, or was it something the owners had already? This is a vent-a-hood exhaust hood that we had customized for the project...check with your local dealer for options and pricing. What material is on the perimeter counters? - Looks like Caesarstone Concetto-white quartz? Yes, we used Concetto - Puro. Was the island custom or was it purchased? If it was purchased, where? I have been looking for a long narrow island for over a year! Any leads would be greatly appreciated! We had this custom made for the space, it is easily moved out of the way for large parties. A suzani-inspired rug can ground a kitchen or dining room and hide spills. This is rug is Suzani-inspired. The lack of heavy ornamentation in this beautifully traditional kitchen leaves ample room for the glorious fuss of the Venetian chandelier. 1. Throw down a colorful area rug. Don't think practical and boring just because it's a kitchen. 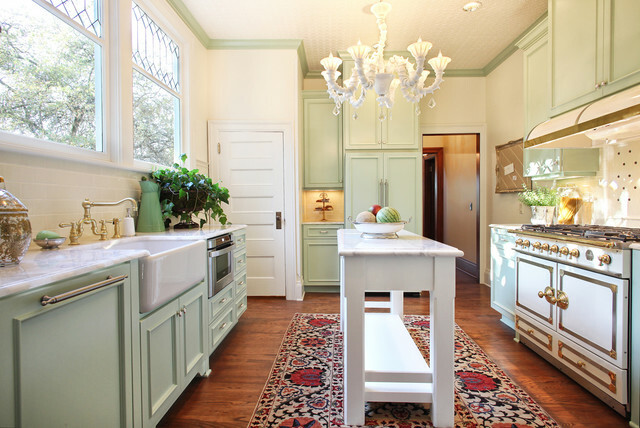 A suzani rug, white chandelier and amazing vintage range oven add to the charm and warmth of this kitchen. If you think that your kitchen may be too narrow for an island, consider a long narrow table like this one. Want to add a high-end feel to a small kitchen? Instead of hanging a pair of pendants over a kitchen island, choose a chandelier in white to keep it bright and airy. The Deluxe Kitchen RemodelIf custom cabinetry, built-in refrigeration and a La Cornue range are all must-haves, you’re talking high style and the price tag that goes with it. This kitchen is for real cooks. It would be a shame to be surrounded by all this gorgeous stuff and not use it.A $100,000-plus kitchen remodel might include: 1. A total rework of the space. Just as with the mid- to upper-range kitchen, don’t be surprised if everything, including the kitchen sink, gets moved, which means new plumbing, electrical, air ducts and so on. Often, you are gutting the space and starting from scratch.2. Architectural consistency. A tall ceiling with beadboard finish, crown moldings, leaded glass windows, authentic baseboard and casing, plus other architectural details ensure that the kitchen space will visually connect with and feel like a part of the rest of the house after the remodeling is done.3. Rich materials and accessories. Wood floors, stone counters, a chandelier and an Oriental rug will all contribute to the high-end style and elegance you’re after.4. Custom cabinetry throughout. Well-made, well-crafted and beautifully finished cabinetry in custom sizes will make your kitchen uniquely yours. Toronto Interior Design Group | Yanic Simard added this to What Color Should You Paint Your Trim? There are upsides to having a traditional, not-so-open-concept Victorian kitchen like the one shown here, though, De Wolf says. She has seen the design pendulum swing this way in recent years, as some clients recognize that keeping the mess and noise of the cooking space separate from the entertaining space could actually be a better fit for their lifestyle.Houses from this time also were sometimes set up for servants, and Kass and De Wolf say spaces like butler’s pantries can often be used to carve out a larger kitchen or living room if that’s important to you.